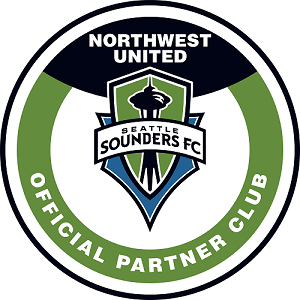 Northwest United are an official partner of the Seattle Sounders FC, Washington's Major League Soccer franchise club. As their eighth official partner, and the sixth in Washington State, the official partnership with Sounders FC allows Northwest United players and coaches a number of unique opportunities. Resources such as education, an exclusive, integrated curriculum and technical support, ID camps and more, while Northwest United serves as a scouting base for Sounders FC Academy programs, identifying young, high-level talent north of Everett, Washington through to the Canadian border. Going forward, all Northwest United teams will wear official Sounders FC partnership badges on training and competition kits. In addition, the Northwest United junior academy is being renamed the Northwest United Junior Sounders Program, and the U9/U10/U11 teams will benefit from the use of Sounders curricula, training sessions, high level coaching and competition to prepare them for opportunities to be identified for the Sounders Discovery Program. They will also be wearing the Sounders FC colors! Winner of the 2016 MLS Cup, 2014 MLS Supporters' Shield and four Lamar Hunt U.S. Open Cup championships (2009, 2010, 2011, 2014), Sounders FC is Seattle's Major League Soccer franchise. With an ownership group led by Seattle-based entrepreneur Adrian Hanauer, Hollywood executive Joe Roth, Seattle Seahawks Chairman Paul G. Allen and entertainer Drew Carey, the club received an MLS charter on November 13, 2007 and has qualified for the MLS Cup Playoffs in every year of its existence. Sounders FC reached a milestone in 2016, as the franchise claimed its first MLS Cup championship with a road victory over Toronto FC, which was followed up by a second consecutive berth in the league championship in 2017. Since the club's debut MLS season in 2009, Sounders FC has set the standard for soccer support in North America, leading the league in attendance for eight consecutive seasons (2009-2016) and routinely ranking in the top 30 in attendance among all team internationally and top three within the Americas. Prior to joining MLS, the Seattle Sounders organization has been a part of the greater Seattle community and U.S. Soccer professional scene since 1974.